Statistics from the horticulture industry’s national peak body, Ausveg, show Asian vegetable production in Australia has grown 27 per cent to 23,419 tonnes since 2005-06. And according to Melbourne region vegetable grower, Greg Rankin, this demand is unlikely to abate any time soon. “We’ve been growing pak choy for 20 years and we’ve doubled our production during the past 18 months – that’s how quickly the market’s growing,” he says. Diamondback Moth is a major pest in all crops with a single grub sufficient reason for an entire pallet of produce to be rejected. “This moth is an extreme problem for us during hotter months,” Greg says. Greg didn’t hesitate to participate in a pre-registration trial for a revolutionary new crop management system that could change the way vegetables are grown in Australia. Durivo is a unique insecticide applied to the planting soil that provides long-lasting protection against armies of grubs, aphids, thrips and other pests in early season vegetable crops. Its manufacturer, Syngenta , says a single treatment at planting will protect young plants for up to 40 days, eliminating the need for up to eight conventional foliar or leaf sprays. Besides its excellent insecticidal properties, Durivo Insecticide produces a visible vigour effect on young plants, allowing them to express their full genetic potential. And best of all, it is applied in miniscule amounts at or before planting, slashing potential spray exposure for workers and delivering significant benefits for consumers and the environment. Durivo Insecticide will become commercially available this spring following its recent clearance by the regulatory body, the Australian Pesticides and Veterinary Medicines Authority. 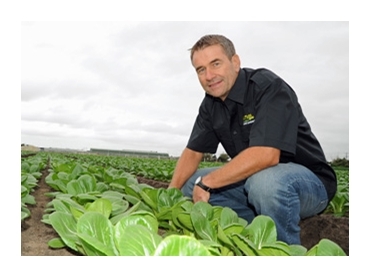 Greg elected to trial Durivo Insecticide in a crop of green-stemmed pak choy last summer. Boomaroo Nurseries treated the seedlings with just 0.03mL of Durivo Insecticide per plant before delivery. “Durivo worked very well and, to be honest, I was quite surprised,” Greg says. Greg says Durivo Insecticides represent a major step forward for the vegetable industry. “We really prefer ‘soft’ chemicals like Durivo because they are so much better for staff and consumers,” he says.